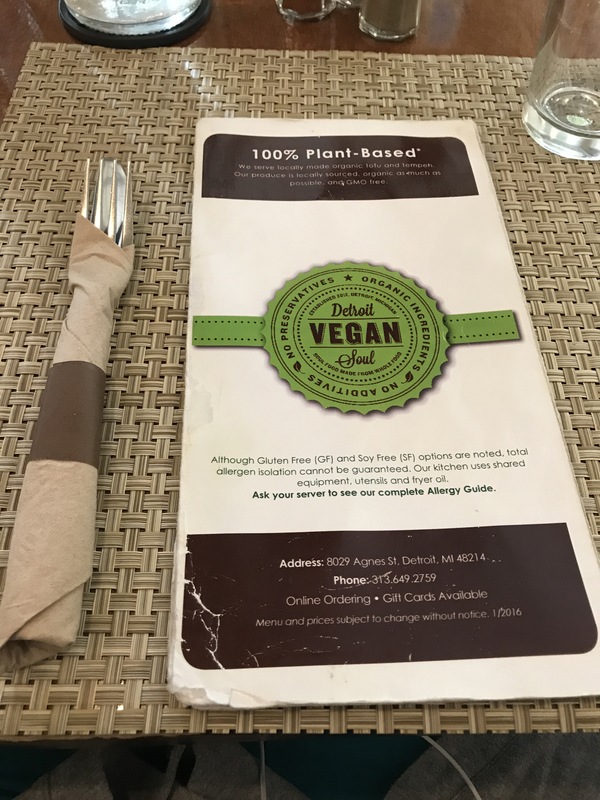 Today my husband took me on an adventure to a Vegan Restaurant that is right in down town Detroit. 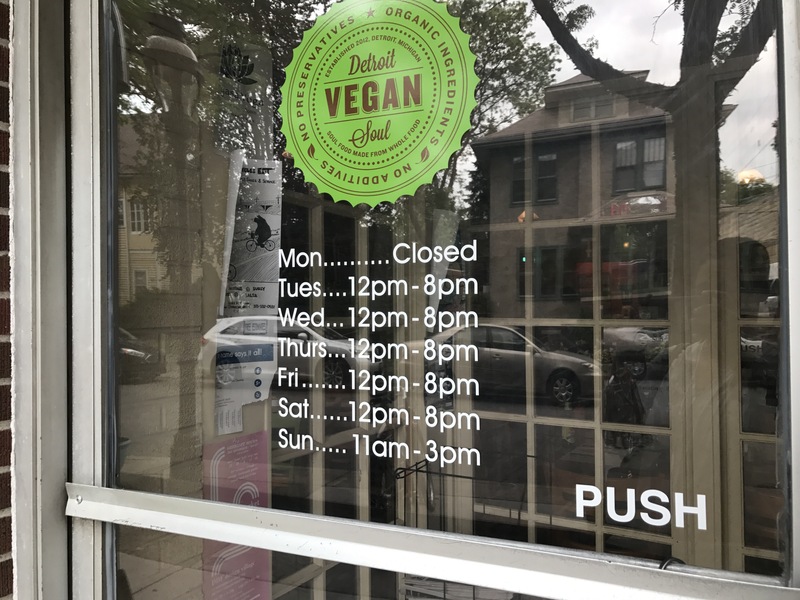 Just to give you a bit of a glance at how things are changing in the inner citie, there are more Vegan/Vegetarian options for the foodies who are looking for healthier alternatives to foods they love. The other misconception that is being obliterated is that vegan/vegetarian food is all Lettuce and lentils, with no flavor. This too, has been done away with. 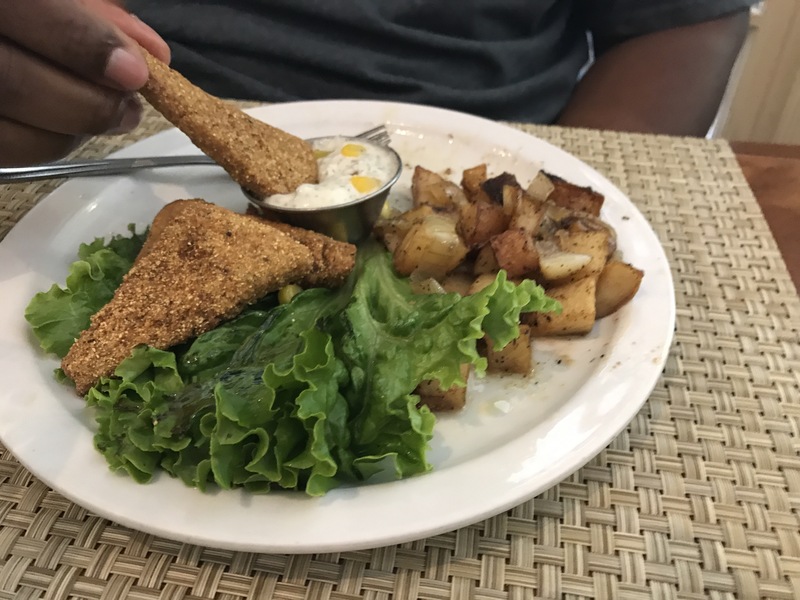 Now, there is an array of options out here, and surely Detroit is delivering a huge plate of goodness to show they can hang with the best of um 😉. 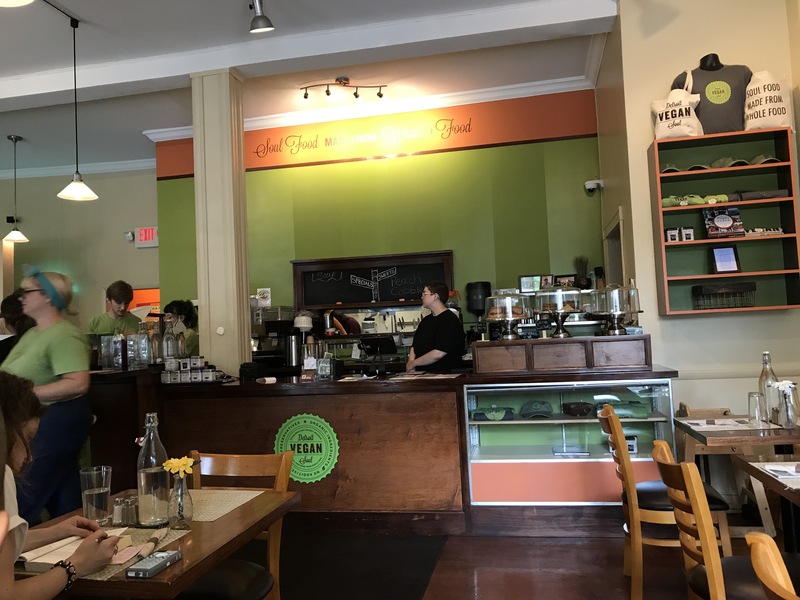 Located at 8029 on Agnes St., in Detroit, the quaint little spot sits on a quiet side street that draws an variety of patrons. 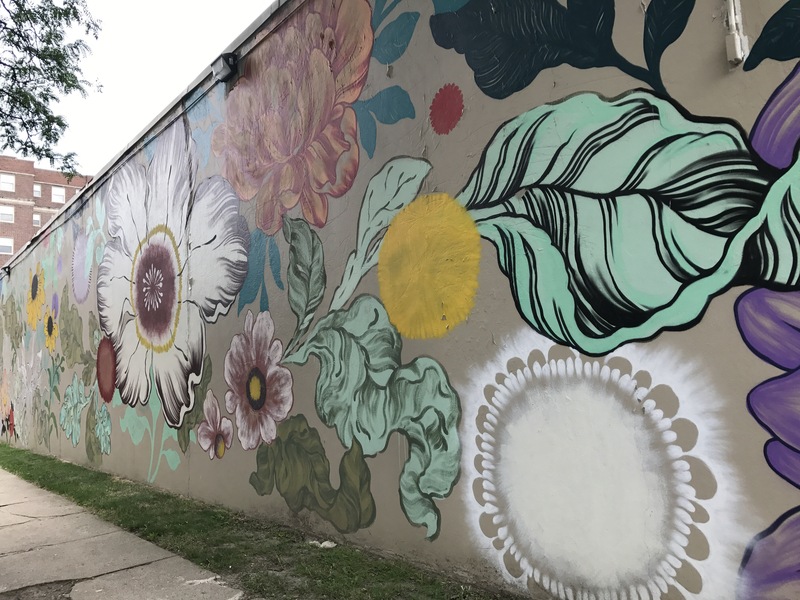 Your are met with street art work, beautiful flowers that mark a parking garage that’s right across the walk. From the local WSU student, to the city workers taking a break from manning the wholes, to the white collar business man coming to grab a bite, and everyone in between. People of all races, cultural , economic and age are here grabbing a bite to eat. I always find that comforting in some way. Food draws people in and causes them see each other. 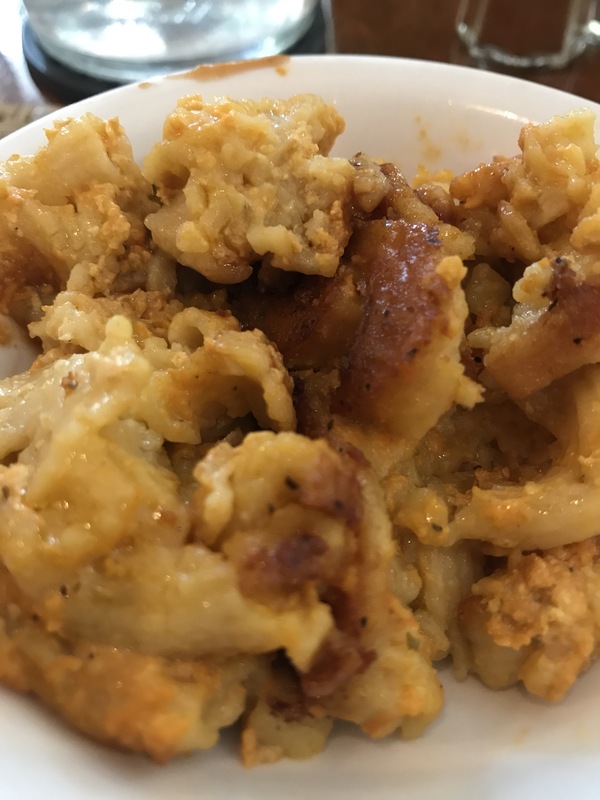 Finding common ground in a plate of food food. 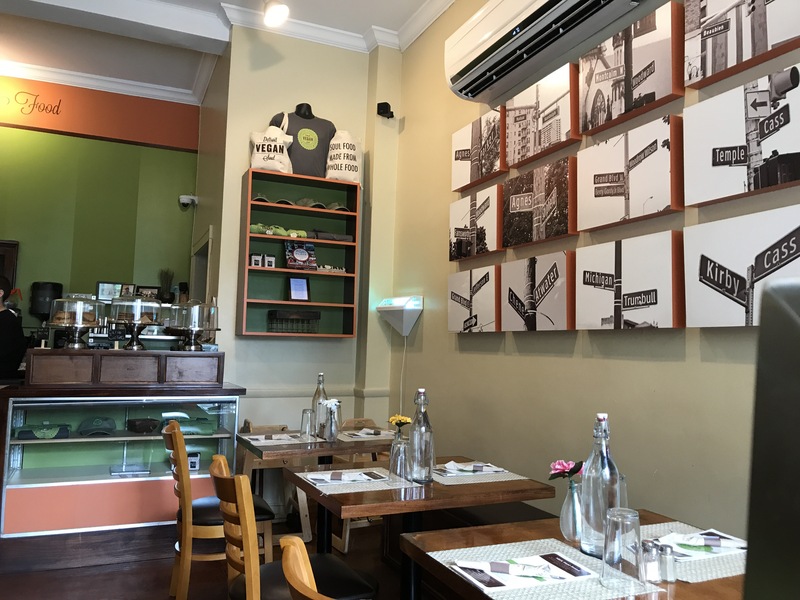 Walking in you are met with friendly faces, and pleasant atmosphere. 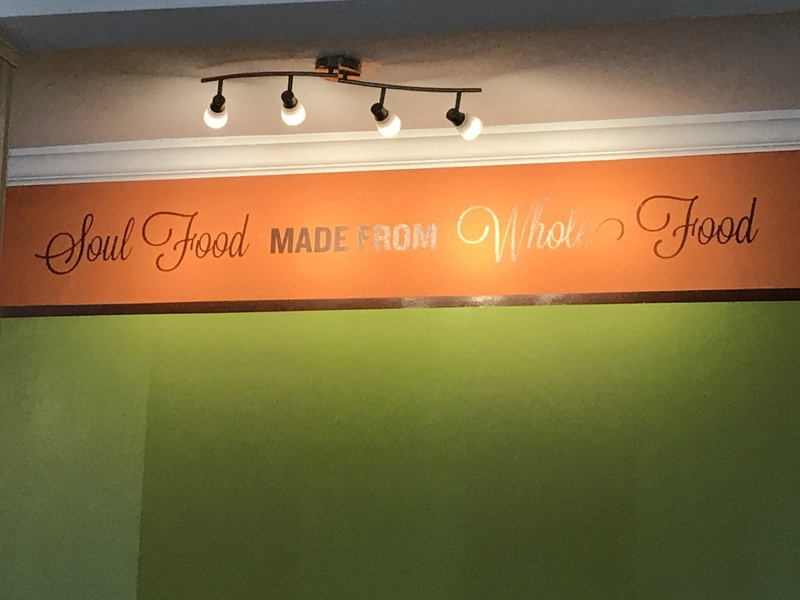 When you enter, you are face to face with the root of their food direction plastered right above their counter, “Soul food is Whole food”. 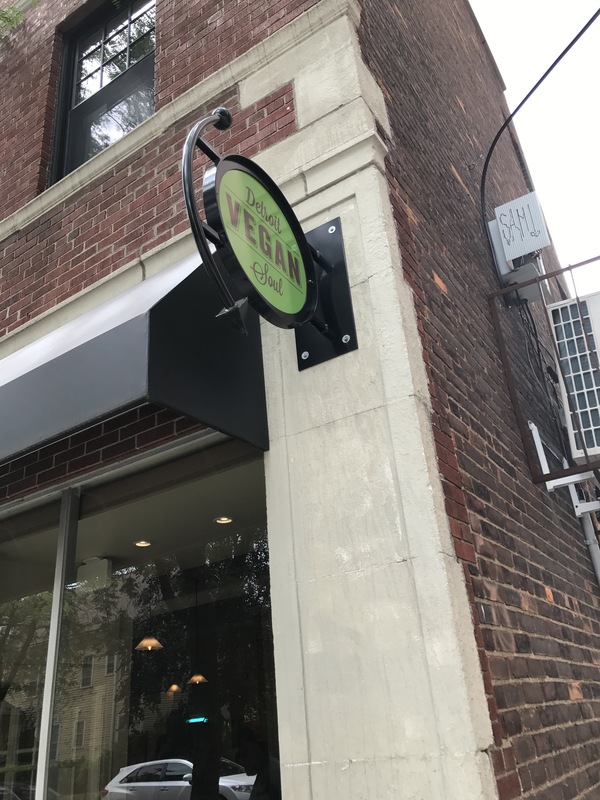 It kinda makes you feel warm and safe, like you can trust them with what they are going to put on your plate. We made it just before the mid-afternoon rush. This is important because you may not find a spot to sit if you get there during lunch time or 5:30ish around rush hour. But, not to worry, they have take out. 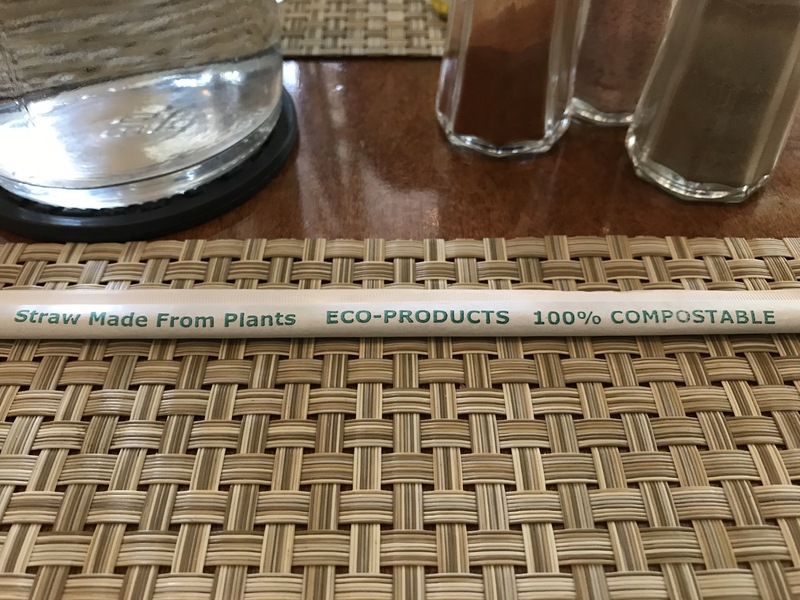 Even the straw was part of a plant based push….then I started to worry, lol. 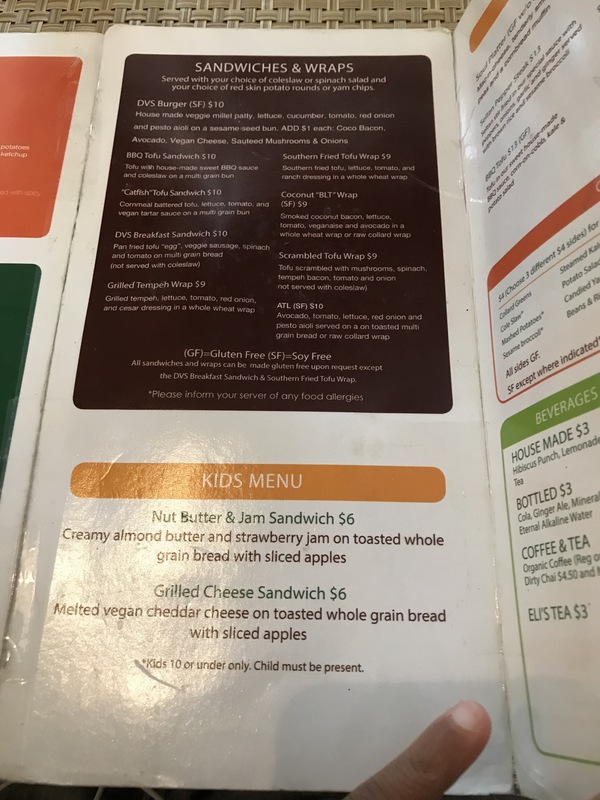 Wondering, “is everything made out of hempseed, and lemongrass?”. I shook my self and said, “have faith, it’s all going to be alright!”. 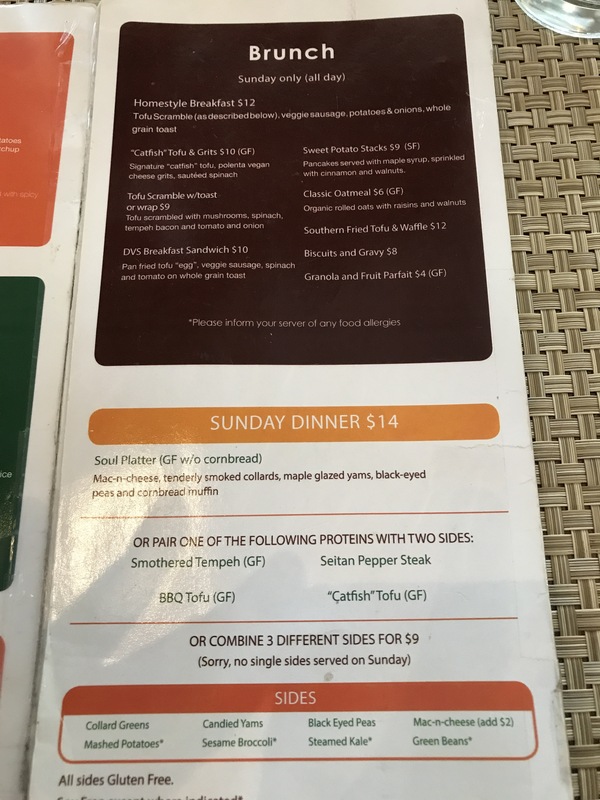 So, I began examining the menu. It wasn’t a huge array of items and combinations, which I really like. It lets me know they have a direction and niche. So, I went for it! 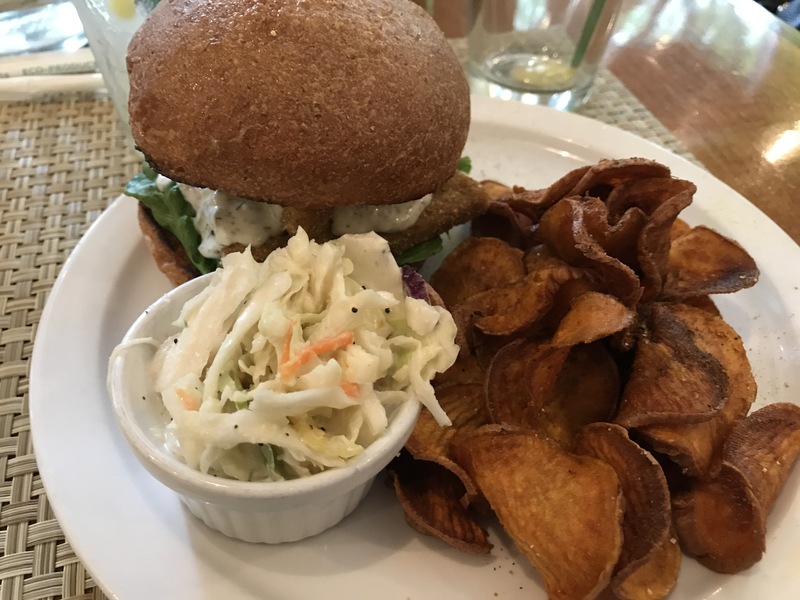 I ordered the Catfhish Tofu Sandwich, with a side is Coleslaw and sweet potato chips. The food portion was more than enough for me. 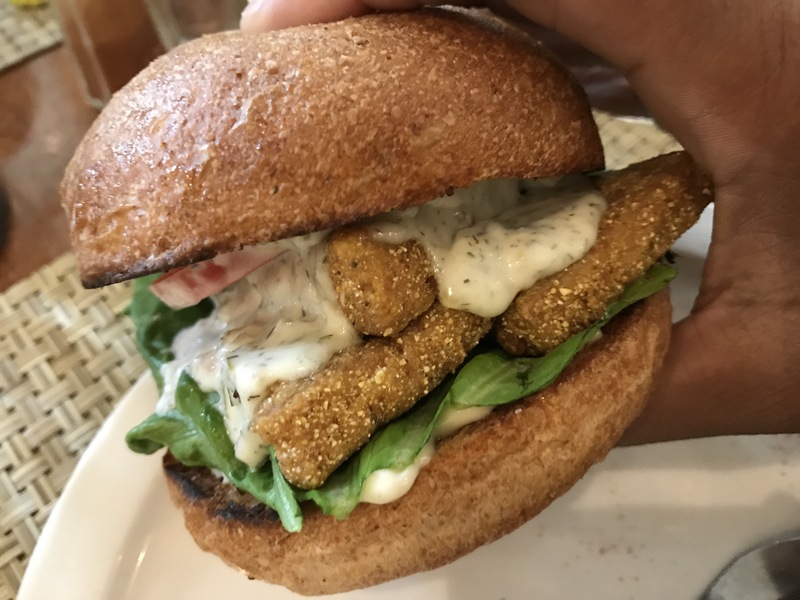 I also liked the size of the pieces of tofu on the burger, just the right amount and not over shadowing everything on the plate. 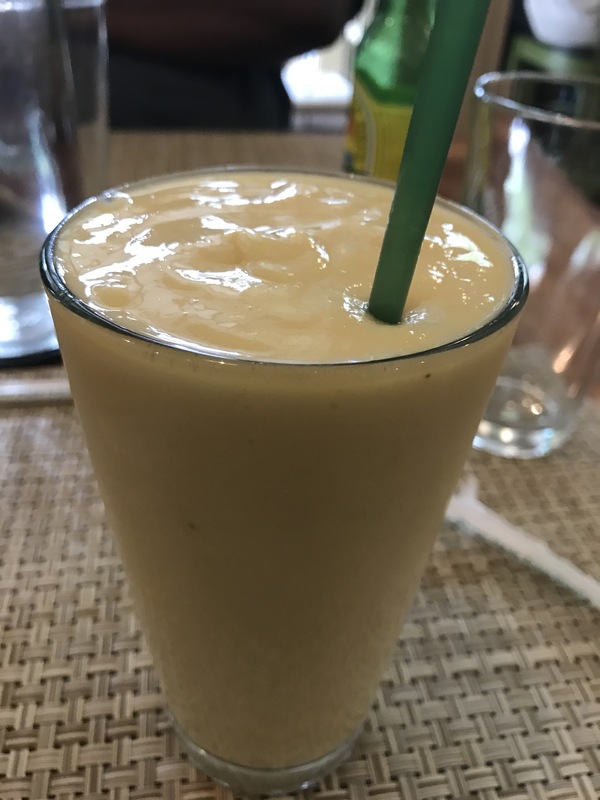 I also enjoyed a nice tropical smoothie, with almond Milk. 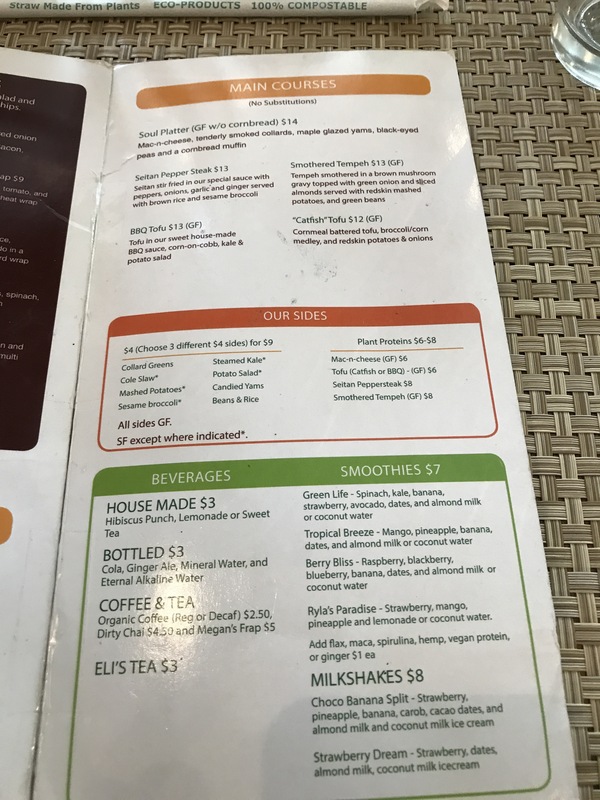 They offer coconut milk if you desire something different or have a nut allergy. Then on to the dessert! 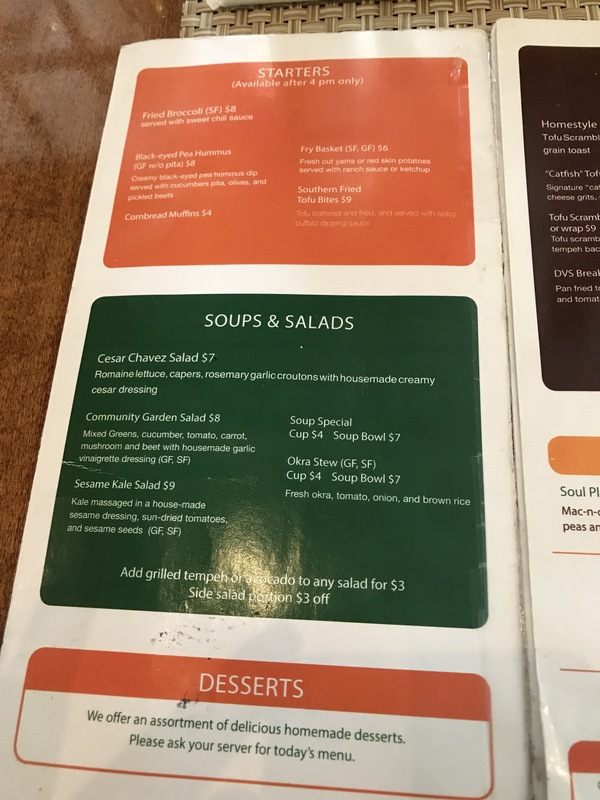 We ordered two that were recommended, the Oh Lala Wal-Nut crumb cake and good old peach cobbler. 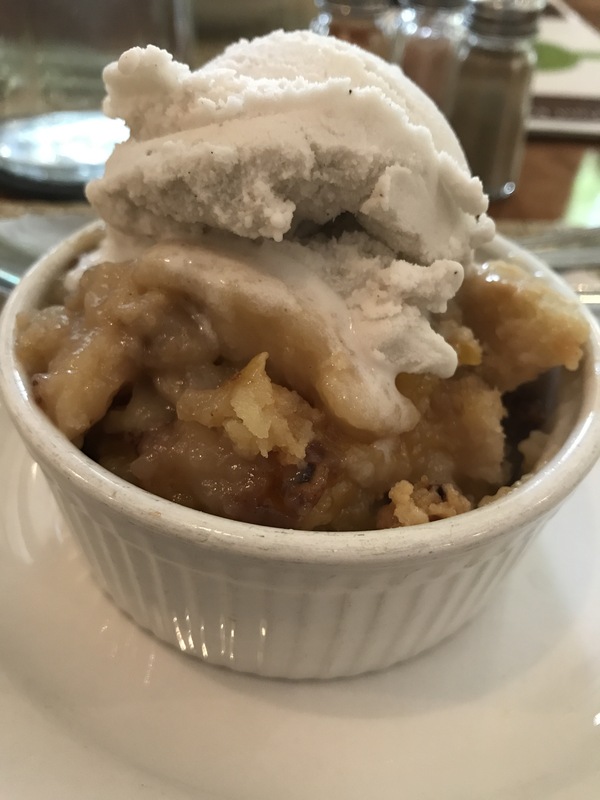 I’ve had better crumb cake, but the peach cobbler, with vanilla bean vegan ice cream…YUUUUMMMM! My hubby got a similar dish, Catfish Tofu plate, with Mac & Cheese, potatoes & onions and broccoli corn veggies. 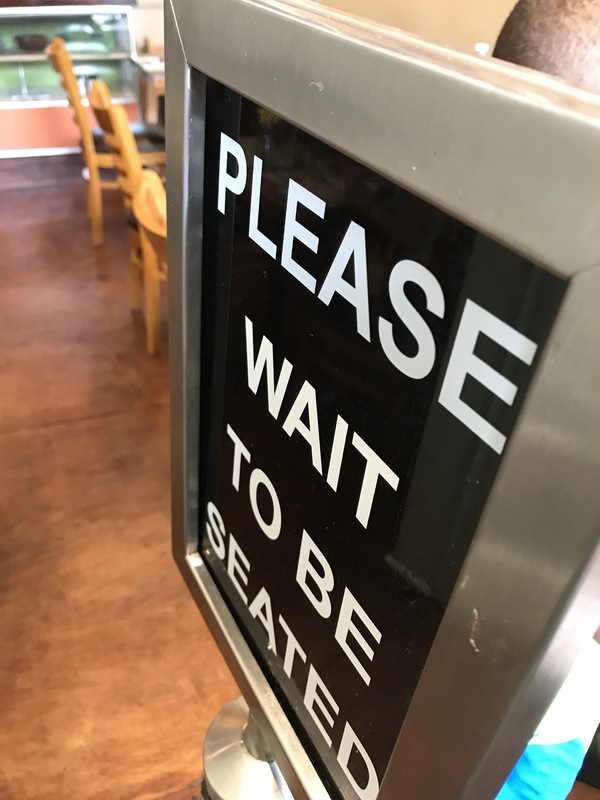 Now, while the food was good, it isn’t a place I would go eat every day. It’s one of those special occasions or to ease a hankering for some good old soul food. 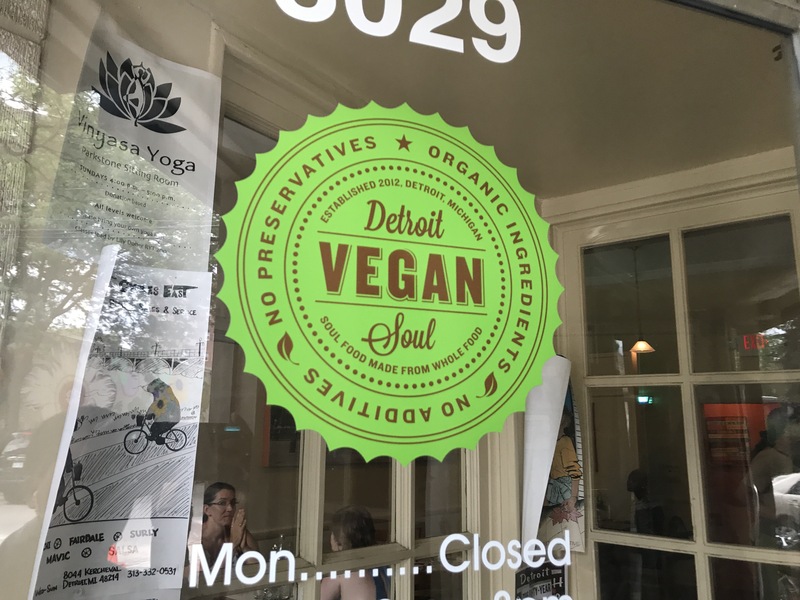 All in all, Vegan Soul was a great experience , and I’m pretty sure you’ll enjoy it too! Please leave a comment, like this post and share.